Have you been following Speedy Steve on his WARDJet.com page or by checking our Facebook? Cheer on the WARDJet-sponsored snowboarder Steve MacCutcheon as he races toward his goal of competing in the 2014 Olympics at Sochi. This past weekend, Steve was in Buck Hill, Minnesota for an FIS North American Cup event. A good rank during NorAm Cup event could help competitors qualify for the 2014 Olympics. 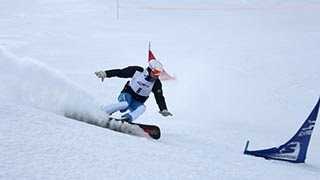 Speedy Steve ranked third out of twenty-eight snowboarders from around the world in the parallel slalom (PSL) on 1/3/14 and fourth out of thirty-one snowboarders on 1/4/14. Way to go Steve! Stay up to date with Steve’s progress, ranking and times by visiting the WARDJet Speedy Steve web page. WARDJet is excited to watch Steve continue competing these next few months and hopes to see him representing the USA in Sochi!